The Mechai Pattana School is for the rural poor of Thailand. Many children from other rural schools end up migrating to the cities for a better education, the Pattana School aims to keep these children at home. This schools mission is, “to create a generation of honest leaders who will improve rural Thailand” they achieve this mission statement by “promoting the following values: environmental protection, education, poverty eradication, philanthropy, integrity, democracy and gender inequality” (mechaifoundation.org). They achieve these goals by encouraging creativity and imagination, which develops the whole individual, not just the intellectual abilities of this person. This school is not only for the children; this is a life long learning center for members of the community. The community members can use the school as well to improve their knowledge of agriculture, business and vocational skills. “This will guarantee that within three years, no family that has children at the school will be in poverty” (mechaifoundation.org). The Mechai Pattana School encourages the interaction and involvement of the students in every step of their education. One way the students are involved is that they have to earn their lunches and tuition. The students earn their tuition and lunches by community service; one lunch equals one hour of community service and to pay for tuition the students and parents must plant 400 trees and do 400 hours of community service. The students are also involved in teacher selection, they get participate in the interview process and help make final decisions. Students also get to choose incoming students; students in the eighth and ninth grade decide on the incoming seventh graders. Another way the students are involved is that two students get to be on the school board and all students can be involved in the schools purchasing and auditing committee. Mechai believes that being apart of these committees helps illustrate real world situations. All of these interactions provide an irreplaceable experience of responsibility and leadership. The two most impressive aspects of this school are that during the student’s education they will operate their own businesses and also get to decide what they want to learn. “Students understand the link between entrepreneurship and philanthropy, and they start many businesses of their own” (mechaifoundation.org). The profits that the student’s make through their businesses provides scholarships for needy children in other rural villages, they also provide these children with tutoring and mentoring. From running a business where they provide for the community, they not only learn how to manage money but also a sense of social entrepreneurship. The other very impressive part of this school is that the children choose which projects and activities they would like to learn more about. The teachers then help facilitate the learning process; they have to think how they can incorporate math, sciences and languages into the subject chosen. Also, the school rarely uses textbooks, they believe the knowledge is limited to what the writer wanted to say, instead they use the Internet where the knowledge is endless and can be unbiased. The students are asked to think for themselves, which develops strong critical and analytical processes. The Mechai Pattana School is creating a generation of children who are globally conscious, well rounded individuals who can think for themselves. Mr. Mechai Viravaidya the founder of this astounding school describes the Dragon Bridge To Knowledge, which truly sums up his philosophy of education. This is a literal bridge built over a canal that symbolizes your walk from ignorance to knowledge everyday. Each morning you walk from ignorance towards knowledge and you have this water, and you should look down and see who’s ignorant and you will see your own face. Then in the evening you come back from knowledge to ignorance again, so we always have to rewind and do it again. There is no end to learning (Mechai Viravaidya). The Pattana School aims to create good citizens who want a good life, know how to earn it and how to share. This school creates well rounded individuals which is worth so much more than an IQ number on a piece of paper. “The Mechai Pattana School.” MechaiFoundation.org. N.p., n.d. Web. 02 May 2013. 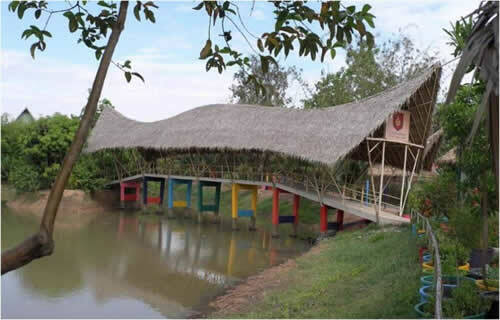 I am very interested in teaching at Mechai Pattanna Bamboo School. I previously lived and taught in Thailand and am familiar with the fantastic work of Mr. Mechai. However, I am unable to access your web at mechafoundation.org. would you kindly email your correct contact address.